whenever I buy something new (or second hand :P) I can't wait to wear it. I usually can't wait more than a day or too. I've been so anxious to come back from my vacation and show off all of my finds from the thrift stores. I can't believe it's been 3 weeks since then and I haven't yet worn them all. there wasn't really any time to do it. 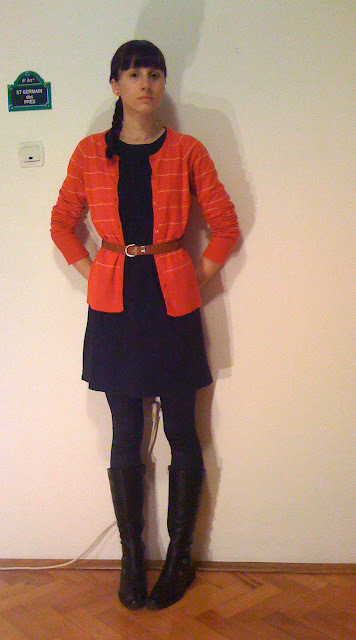 so today it was the orange cardigan's turn to get out of the closet and into the brave new world. I knew I wanted to keep everything else nice and simple so it would be the piece that stood out the most. I opted for a little back dress which is a little too big for me. it was a lucky find at the flea market many years ago and the gypsy lady selling it kept telling me it fits just fine. I always wear it with a belt, and so the brown belt I just thrifted was a perfect choice. I was kinda bending my own rules here, since black and brown don't go together in my books. 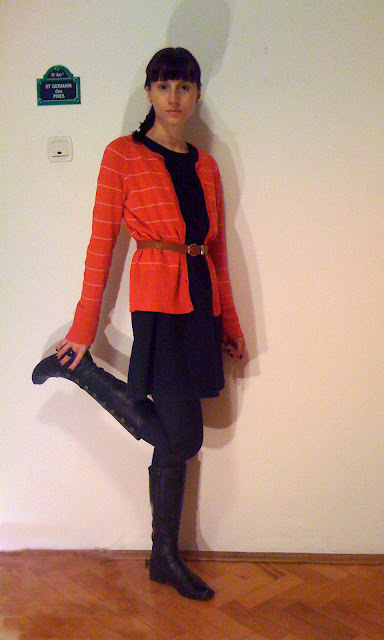 in the end, I think the colors complemented each other really well, the outfit was nice and playful and had just that touch of color I needed.